How is your day so far ? Hope everybody always in a good and happy mood. Alright am gonna share with you the latest news in town at the moment. Sunday Cowboys Football Club will organizing again their annual Super 9 tournament on month of November 2011. This tournament is being sanctioned by FAS and under the patronage by YB Edward Lee (PJK) Adun Selangor, Kawasan Bukit Gasing N.34. 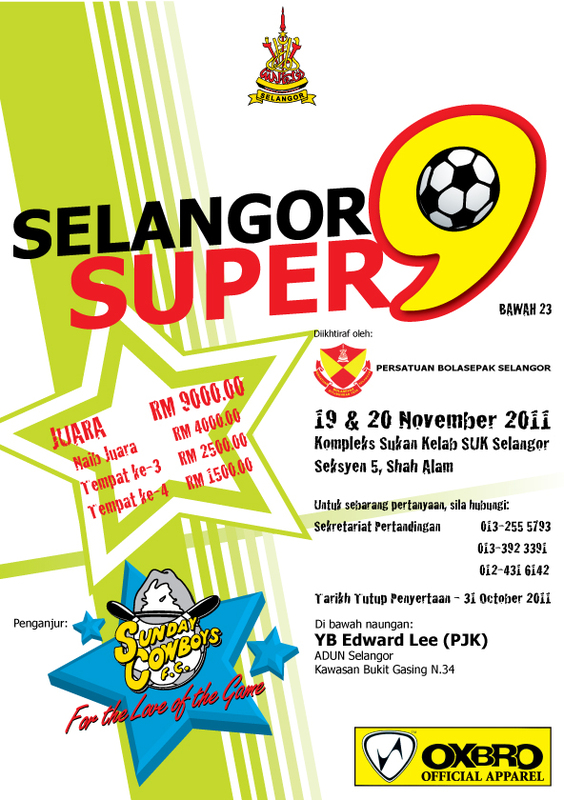 This year round the organizer increased the prize money to the champion (please refer to the poster). Who is Sunday Cowboys Football Club ? Sunday Cowboys Football Club was formed in 1989 as a social football club for people who were passionate about the game but for some reason or another could not pursue a full-time playing career. Over its 20 years, the club has gained popularity among football lovers all around the Klang Valley with some over 800 players having played for the club. One of the main attributes for the club’s staying power and popularity is certainly the diversity of our players and members from varied cultural, ethnic and career backgrounds. A noteworthy attribute that is still prevalent to this day. The fun-filled camaraderie and good team spirit not just between our players but overall between them and the management, owners and other clubs as well is another thing that we are extremely proud of. In 1996 and 1997, after having traversed throughout Malaysia for friendly games, the club went abroad to take on reputable sides like the Western Australia State Team, Perth Entertainers FC and Golden Lily FC in Perth, Western Australia. Today, the club boasts 2 squads, a social squad as well as a league squad that plays in the Football Association of Selangor (FAS) Division 1 League.